On Monday, November 3, 2008, I was walking in the woods on the rim trail along Six Mile Creek in Ithaca when I decided to look at a beech tree to see whether it had any beech nuts. To my surprise, I noticed a snowy white material on a lower limb which didn't make much sense since the air temperature was in the fifties. The cotton candy-like material seemed to be attached to a tiny insect which was bobbing up-and-down. I took the branch to the local Cornell Cooperative Extension office on Willow St. for identification. I had to leave it there. On my walk, I found only one beech tree with only two of its lower branches covered with the eye-popping adornments. No other nearby trees even had a hint of the snow-like creatures. As I was leaving I noticed a professional gardener who I called over to have a quick look-see. He casually mentioned "Woolly Aphid", adding that he had never seen one before but would look it up... That's what I had found: a colony (clone?) of woolly aphids. Monica Roth, the Ag Extension Agent called me with the news that its official name is "Beech Blight Aphid" but, despite its threatening name, it is not really a threat. It is also called the "Boogie-Woogie Aphid" due to the dance-like effect that occurs throughout the colony. See a Boogie Woogie aphid dancing on You Tube. 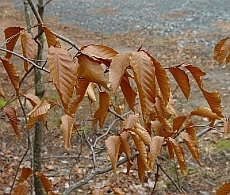 Open-grown beech trees have a low, wide, spreading crown comprised of many long horizontal branches. The smooth, thin, tight-fitting bark is silvery gray. It covers the trunk and branches like a skin. Leaves are coarsely serrate, simple, and alternate on the twigs. Each leaf is three to five inches long with parallel veins terminating at the marginal teeth. 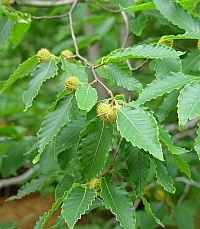 It resembles the leaves of American Chestnut, Castanea dentata since both chestnut and beech are in the same family, Fagaceae. The tapering winter bud is about an inch long and polished brown. Male and female flowers occur on the same tree in early spring, just as the leaves are emerging. By early autumn, two or three small, triangular, highly-polished, brown, sweet-meated nuts are encased in a small prickly bur. These edible nuts are responsible for the classical Latin name Fagus, from the Greek, "phagus", meaning to eat. It is a highly shade tolerant tree.